You are currently browsing all posts tagged with 'Gardening'. Displaying 1 - 4 of 45 entries. Whether you are a green thumb guru, or a serial plant killer, I’ll bet you’d love to have a gorgeous avocado tree in your collection. One thing that has often held me back is the cost of the lovely things in nurseries or online, way more than I want to spare. 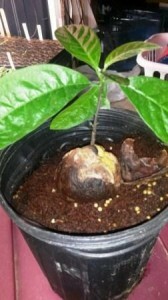 What I want to suggest to you, if you can have some patience is the idea of ‘growing your own avocado tree’. This could even be a project with your kids and they will LOVE it! Now – I can’t promise that your avocado will grow up and produce lovely baby avocados, and even if they do produce it will take probably 4-15 years before you can expect to see any ‘fruit. In some cases your tree will never bear fruit, but I would hope you can enjoy an interesting addition to your plant collection. However, if you want a fun activity for anytime of the year, but especially now when the weather outside is so icky and I can’t wait for Spring to get here. 1 – Go to the grocery store and buy 1 or 2 avocados, they will probably be very hard which means they aren’t quite ripe enough to eat yet. Take them home and set them on your counter for a few days to a week to ripen. It also doesn’t matter if you get the smaller palm sized darker avocados or the larger Hass-type avocados because they will all have a large nut-like seed inside. 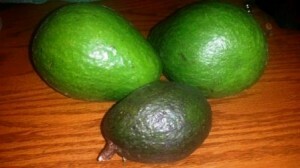 2 – When the outside of the avocado yields to a slight squeezing, they are probably ready. 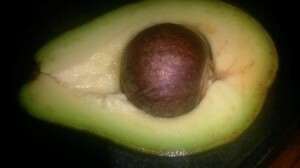 Take a good knife and slice around the outside of the avocado going around the longer side. Slice down gently until you feel the seed against the blade of the knife and try not to press too hard against it. 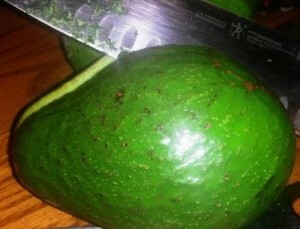 The blade should cut through the avocado flesh very easily. 3 – Be sure to clean the avocado off the seed with a paper towel, and possibly a brief soak in water before cleaning with paper towel. Be sure to leave the brown papery seed covering on the seed to protect it. 3 – Now that the avocado is cut in half, twist the top and bottom pulling them gently apart. This will reveal the yummy green goodness in the center with the large seed in one half. You can pop the seed out and set it aside for a bit (even a day or so will not hurt) as you decide how best to eat your avocado – the other benefit is the enjoyment of eating the avocado. Baked egg in avocado – This recipe is full of Omega 3’s and contains heart-healthy fatty acids and a high protein count.-What a terrific way to start a day or enjoy anytime.. Preheat the oven to 425. Crack one egg per avocado half and pour the egg into the hollow left by the seed. You might need to hollow out enough of the avocado for the egg to fit comfortably in the center. In a small baking dish place the avocado half/haves. Cook for about 15-20 minutes depending on the size of the avocados and the heat of your oven. Remove from the oven and garnish with a bit of salt and pepper to taste and any fresh herb you may have. You can also at a dollop of your favorite salsa. Now, Enjoy! Guacamole – use your avocado in your favorite guacamole recipe, there are so many delicious ones out there and enjoy! There are tons more ways to eat these delicious avocadoes, what is your favorite recipe? 5 – Opps – sorry about that. I got just a bit sidetracked thinking about the deliciousness of the avocado. Now, back to growing your very own avocado tree. 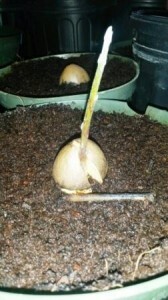 6 – There are ways to grow these avocado seeds by placing in a pot in a soil-less mix and I’ve grown a number of avocado seedlings this way. However, one of the easiest and most fun ways is to take 3 toothpicks and gently insert them at about the ‘equator area’ of the avocado seed. 7 – Then using a small glass or plastic cup, balance the avocado in the glass allowing the toothpicks to suspend the seed about half in/half out of the cup. It’s very easy to tell the top and bottom of the seed, so just be sure the ‘bottom end’ is the side that is down in the cup. I have quite a few seeds here in water cups… hmmm… Husband is looking at me strangely. He seems to think I’m overdoing it on avocado seeds…. oh well, nobody is perfect! 8 – Pour enough water into the cup to be sure that the bottom of the seed remains wet, then set the seed and cup in a safe place. 9 – Every few days check your seed to be sure it has enough water to cover the bottom of the seed and add water if it needs more. If you see the water starting to get ‘cloudy’, pour it out and add fresh water possibly every 5-6 days. NEVER let your seed dry out after this point. 10 – In time (and the ‘time’ varies and this is where you need the patience), the seed will crack and then a white taproot (about the size of a pencil lead) will push its way out of the seed downwards. You can leave this in the water cup for a while, watching the root grow and then the small stem begin to poke its head upward. This is SO exciting, but remember to NEVER let your taproot dry out! 11 – When you are ready to plant, I would suggest a medium small pot about 8”-10” or maybe a pot the size of a nursery gallon plant with a rich planting soil mix. This will enable the roots to grow but not overwhelm the new plant. Put on a sunny window and watch it grow. 12 – After the stem gets to be about 12” tall, you will want to pinch out the tiny growing tip to help the tree to produce more side leaves. After that, about every 6” you will want to pinch out the tip to let it continue growing at a good, but slow pace. 12 – An avocado is a tropical plant and probably doesn’t want to be in temps below 45ͦ F. So if you have cold/freezing winters, the plant will definitely want to be indoors in a sunny window. 13 – Also, if you let your seedling dry out too much, the leaves will dry out into a papery substance and then drop off. Remoisten the plant and if it’s not dead, it will grow new replacement leaves. 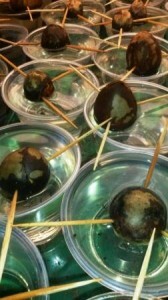 Lastly I’ve started a lot of avocado seeds this past year and had the best time doing it. Occasionally Mother Nature will through a twist into something that is usually very basic. The stem of this particular seed popped out of the seed with 5 distinctly separate, but touching in a straight line, stems. They continued to grow and as you can see they’ve started to separate and 4 of the 5 have leaves at this point, but the ‘pinky’ stem is till holding in there. 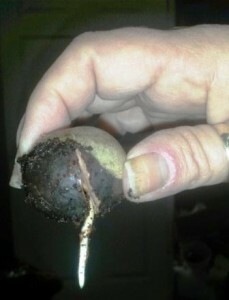 Cautions: No – there is no guarantee that EVERY avocado seed you try this way will grow, however most will if you maintain the moisture on the bottom side of the seed. Thanks for letting me share my love of avocado seedlings with you. If you love eating avocados as much as I do, or even if you only eat them occasionally, try starting an avocado from seed. You’ll have a great time! Dolly Basil is a great Genovese basil. 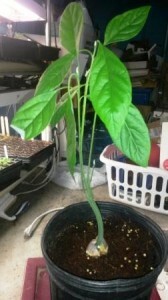 Fast growing, with large, uniform leaves. So yummy and so easy to use. Plant some in a pot on the windowsill and enjoy the fresh herb in your cooking all winter long! 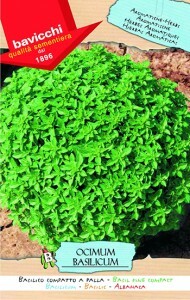 Ball Basil has small, thin and smooth bright green leaves that are intensely scented. 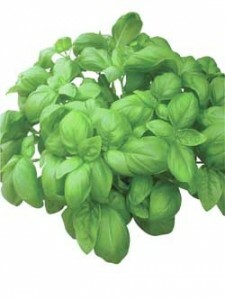 Perfect rich, spicy basil flavor, great for Italian dishes. A wonderful new basil with a unique fruity, mulled-wine aroma associated with Christmas time. 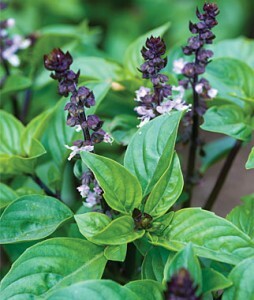 A lovely blend of thai and genovese that makes a lovely tasting basil. Culinary uses – pesto, pasta sauce, soup, tomato and vegetable dishes. Use in baskets, containers, cuisines, ornamental and outdoor.